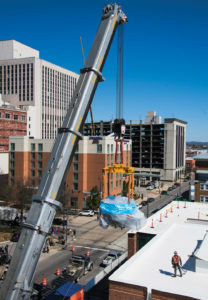 A heavy-lift crane was brought in to place Emma in her new home at 4th Avenue and 20th Street. She’s a big girl, Emma is, originally from Germany. Her 90 tons were eagerly anticipated at the University of Alabama at Birmingham, as she made her way across the ocean on the MV Tugela, a vehicles carrier, to the Georgia Ports Authority facility in Brunswick, Georgia. A specialized truck, with 20 axles, 78 wheels and drivers in front and back, then carried her through winter storms to the university, where a heavy-lift crane assembled on 4th Avenue South lifted her into her new home, a Proton International facility. Emma is a cyclotron, a vital cancer-fighting tool that aims beams of protons at tumor sites to treat many forms of the disease. It’s so new that it can only be found at 29 places in the United States. Proton International began construction on the site at 4th Avenue and 20th Street in January 2018 and it’s expected that patients will be treated there by early 2020, after Emma gets her testing and calibration. The cyclotron focuses the energy at the tumor location so precisely that it does minimal damage to healthy tissue nearby, sparing the patient from side effects often seen with standard radiation. “This is an extremely advanced form of radiation technology, and we look forward to offering this cutting-edge approach to our patients and families in Birmingham, across Alabama and beyond,” says James A. Bonner, M.D., the Merle M. Salter Endowed Professor and chair of the UAB Department of Radiation Oncology in the School of Medicine. It’s estimated that about 250,000 cancer patients in the United States alone could benefit from proton therapy, which works best on tumors of the brain and central nervous system, eye, gastrointestinal tract, head and neck, liver, lung, prostate, spine and some breast tumors. The minimized damage to surrounding healthy tissue makes it a preferred option for treating children with cancer. The university is leasing the property to Proton International, which will own the facility. Planning and pre-treatment will continue to be done at UAB’s Hazelrig-Salter Radiation Oncology Center. The medical staff will be from UAB.